Collectively, we have more than 145 years of real estate experience. And we do not believe in the ‘one size fits all’ mentality. We are dreamers and doers, experience seekers and visionaries, who embody the concept of what it means to be one-of-a-kind. We’re so excited to show you how we continue to chart new paths for new and innovative trends and designs for our clients. 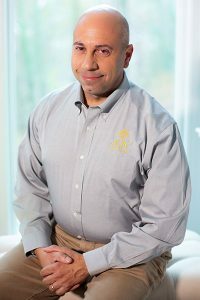 Based in McLean, Virginia, John Joy has been in the business of building dream homes since 2003. From his father, a commercial real estate developer in the Washington, DC area, John learned about construction, and spent more than 25 years as a real estate agent before realizing that builders weren’t listening. It was difficult finding homes for his clients that would suit not only where they were at that point in their lives, but also anticipate future needs to enable them to age in place, so he started his own company. John’s wife, Lisa Joy, an attorney whom he met at the settlement table buying a property 17 years ago, now handles most of Joy Design + Build listings and sales, and is an agent with McEnearney Associates in McLean. Lisa was a package deal with two daughters now 28 and 22, and the couple were lucky enough to have a son Jack together who just turned 16. Jack and John love to surf all over the world and Lisa is a hoarder of sea shells so it’s a good combination. Recently, the family returned from a trip to Tavarua, an amazing 26 acre island in Fiji. 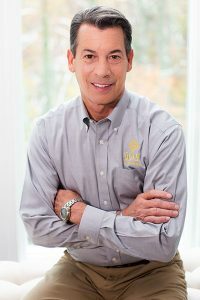 After a brief career in teaching, Phil launched into the bustling real estate market of Northern Virginia with John Joy, the fearless leader of Joy Design+Build. John taught Phil a lot of what he knows today, including how to identify and pursue quality building lots. Phil is the front line for finding suitable lots on which to build your dream home. Phil is not afraid to go the extra mile to find the perfect lot for you. Phil is an avid outdoorsman, ad when he is not pursing land for Joy, he can be found (or not found) chasing fish and game in the wilds of Virginia. Phil is very proud of his daughter Virginia, currently a sophomore at East Carolina University. Purchaser extraordinaire, Adam knows building dream homes requires accurate accounting of all construction elements. With a degree in building construction technology from Penn State at Williamsport, Adam works for you, coordinating with vendors and subcontractors to streamline the contract process. And when he’s not working for you, Adam enjoys the great outdoors: on the slopes skiing and snowmobiling, or riding the waves and boating. Adam lives in Reston, Virginia with his wife. A DC Native, Rick has an in-depth knowledge of the DC metro area with relationships spanning decades. A hard worker, Rick learned his work ethic spending summers on his grandfather’s 100 acre farm near Sugar Loaf Mountain. Rick is a self-made man, starting as a carpenter, owning his own framing business, later supervising all aspects of building, and over the last decade, management and sales. Experience makes the difference with crucial knowledge to guide clients in appropriate building decisions, while Rick’s love of home design offers creative suggestions to create their dream home. Rick recently joined Joy Design & Build, a perfect fit, allowing him to do what he does best, introducing clients to their gorgeous new home! Rick and his wife Victoria, live in Vienna with their ménage of cats and dogs. They have 5 children, and one very important granddaughter. He spends his spare time gardening, boating, and when possible, traveling. 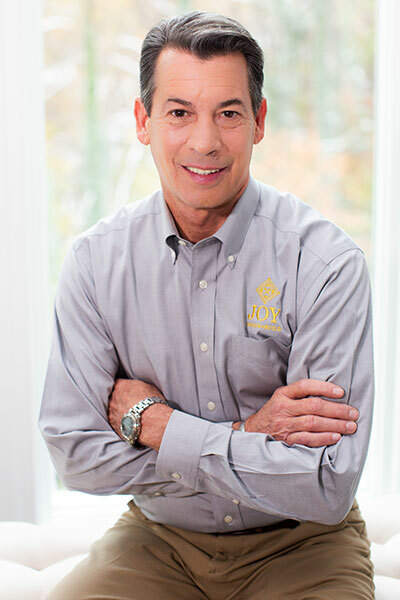 For more than 35 years, Bob has enjoyed completing custom homes, major rebuilds, and historical renovations. Bob provides expert project management, monitoring with extraordinary attention to detail, every aspect, starting with creating a budget that conforms to client expectations. Delivering the finest quality construction, executed professionally and efficiently, Bob offers options and solutions, always ensuring clients are completely satisfied with their building experience. Bob has five grown children and lives with his wife in Berryville, VA. In his spare time, he enjoys traveling with his wife, participating in anything outdoors and recreational activities, and completing many woodworking projects. With over 30 years in the business, Tim owned his own construction company prior to transitioning to working with custom home builders in 2006. Whether it’s renovating an old farmhouse or building from the ground up, Tim has the expertise to execute your dream plans. Originally from New Jersey, Tim graduated from the University of Scranton with degrees in criminal justice and sociology and was a US Park Police officer for 11 years. In his spare time, Tim does judo and enjoys traveling with his wife. Tim lives in Rockville, Maryland with his wife and has two children. Jason’s mastery of the market helps him select quality lots, address development challenges and secure building permits. Working onsite with inspectors, engineers, and community planners, he readies your dream lot for groundbreaking. Originally from San Diego, and after starting his career in the furniture business, Jason has been working in real estate with Joy Design + Build for 10 years. When he’s not scouting for the perfect lot, you may find him on the tennis court, the gym, or unwinding with friends over a glass of wine. Jason lives in Ashburn, Virginia with his wife and three children. After spending 13 years branding events for The Dandelion Patch, a luxe wedding stationer, Heidi brings her marketing experience and messaging savvy to the luxury home marketplace. Heidi works closely with the team to create and implement all corporate marketing, communications and advertising strategy. She is committed to growing market awareness for Joy Design + Build and their extraordinary capacity to build dream homes that are inspired investments. Originally from San Antonio, Texas, and armed with a marketing degree from Texas Tech University, Heidi moved to Vienna, Va, where she lives with her husband and two children. Heidi loves HGTV, smart girlfriends, champagne and reading. You’ll find her nurturing her addiction to Home Goods or on one of her regular four mile neighborhood walks where she’s on a first-name basis with every dog. Tara accompanies you to outfit your dream home. From appliances, plumbing and cabinetry, to lighting and tile (her favorite element), this expert personal shopper proactively communicates with vendors and construction teams to ensure the selection process runs smoothly and on budget. With her timeless style, Tara joined Joy Design + Build three years ago after two decades working with A-List clients as Home Collection designer for Ralph Lauren. Originally from Trinidad, Tara has lived in all regions of the United States before moving to DC after attending college in Florida. Tara has two grown children in college and resides in McLean, Virginia with her husband. At age 12, Marc started to learn the carpentry trade, working alongside his dad, growing up in Massachusetts. With an eye for building great houses, Marc joined Joy Design + Build over three years ago. Whether the project is a teardown or a remodel, Marc keeps the construction site running smoothly, knowing you, the customer, appreciates his attention to detail. When he’s not working on your home, Marc enjoys family summer trips to the beach and skiing in the winter. Marc has four children and lives with his wife in Oakton, Virginia. With a masters in landscape architecture, John’s specialty is in designing outdoor space that complements the homeowner’s interests and lifestyle in a meaningful way. John’s degree in civil engineering ensures that the technical components of a project: grading, drainage, structure, pool hydraulics … are all key considerations on every project. John’s interests are sailing and skiing and takes to the mountains or the water whenever possible with his wife and three young children. With a background in custom cabinetry and construction, Chris joined Joy Design + Build five years ago to build with the best of the best. Whether it’s a new custom design or a renovation, Chris utilizes his master building skills to ensure your plans are executed with quality materials and on time. Born and raised in Delaware, Chris earned an engineering technology degree from the University of Delaware. In summers, Chris enjoys playing golf and spending time with family at Bethany Beach in Delaware. A life-long Philadelphia Eagles fan, in the winter months you may spot Chris in the stands routing for his home team. Chris lives in Leesburg, Virginia with his wife and young son. Kristy has kept Joy Design + Build office operations running smoothly for over six years. From overseeing requisitions to coordinating with vendors and managing payroll, Kristy provides seamless administrative support for this growing design-build company. From Syracuse, New York, Kristy now lives in Ashburn, Virginia with her husband and two young sons. Every spare moment is cherished with her family, and when she can, Kristy loves visiting Loudon County wineries and breweries.